On this day - Page 5 - Hob Nob Anyone? I'd forgotten just how bad wiggy was, but I do remember how poor flat-face was, which was a shame for a pro who'd done so well for us the previous seasons. A bit unrelated to this thread but I need to know the year of the Blyth Spartans tie that was played in the afternoon due the the miners strikes ? its all about to where I was working at the time. And on this day 33 years ago Lincoln 0 Reading 1 . and the last of our 13 wins at the start of the season. windermereROYAL A bit unrelated to this thread but I need to know the year of the Blyth Spartans tie that was played in the afternoon due the the miners strikes ? its all about to where I was working at the time. pretty comprehensive, and I find you can then take the finer details and get more from other Google* searches. windermereROYAL And on this day 33 years ago Lincoln 0 Reading 1 . and the last of our 13 wins at the start of the season. I was there. We had a side of their main terrace (as it was in those days, before becoming their main stand). Don't remember much other than Tricky Trev scoring on or about or just after HT. Next match was the 2-2 home game with Wolves. Remember this more for the then attendance capacity busting restrictions imposed on EP ("Offici ally" 13,000 there that night? ); Mike Lewis cooking the actual gate receipts and (allegedly) pocketing some/most of them; the "away end" being made open for home fans; the 48 Wolves fans in A Stand displaying "Bhattis Out" banners (their overseas owners at the time) that nobody other than the Southbank could see (pointless); and as for the game I can't remember any of it other than the disbelief that we didn't beat a lowly Wolves team. Next game was Bury away in the fog and got beat 3-1 in a totally inept performance. I was there for that too. Remember thinking we played like we were already up. Which, I suppose, we really nearly were. I was at that Wolves game too. Incredible to think it was that long ago. That was the only home game I went to that season. I did go to Fellowes Park for our 6-0 drubbing at the hands of a rampant Walsall side the following February so I was a bit of a curse on the club that season. On this day in 2008 we played out a cracking 0-0 draw with QPR. Reading and QPR played out a goalless draw in Saturday's Championship match. QPR, who scked manager Iain Dowie on Friday, forced good second-half saves from Marcus Hahnemann through Daniel Parejo and Akos Buszaky. Reading went close to taking the lead just before the break with Radek Cerny saving Noel Hunt's close-range header. QPR were also lucky to survive two good penalty appeals while Kalifa Cisse's header almost grabbed the win for Reading late on. "A 0-0 draw is not the end of the world. As people famously say, we can extract the positives. We tried to win the game. "We can criticise some of the things we did but as long as I have that kind of effort every game I won't be too disappointed." "There are discussions about the team and discussions about individual players. "Flavio has put a lot of money in the club and he wants to know how his investments are going. "Already we have made a point that we are going to be meeting regularly, not just with Flavio but with the other people who have put their money in the club. "I have the final input on who goes out there and talk my way through the meetings justifying every player. But with a performance like that today the team picks itself, which is a great problem to have." Reading: Hahnemann, Rosenior, Bikey, Ingimarsson, Armstrong, Kebe (Long 80), Gunnarsson (Harper 73), Karacan (Cisse 73), Stephen Hunt, Noel Hunt, Doyle. Subs Not Used: Andersen, Kelly. Old Man Andrews On this day in 2008 we played out a cracking 0-0 draw with QPR. Chris Armstrong was on of our best LBs of recent times IMHO. I hope he is okay. What a great bloke. Maybe we just don't have enough Icelanders in the team? Anyone know how the Andressons are developing? 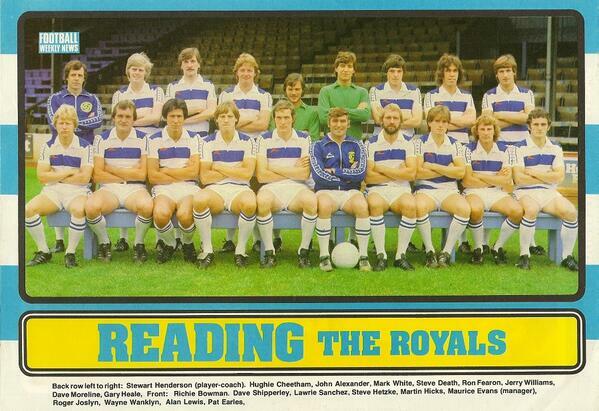 Look at QPR's team as well - some absolute quality there. Akos Buszaky! I just put that team on my left hand computer screen at work and the current team on my right hand moniter and just started uncontrollably weeping. On this day in 2003 we lost a Reading legend Stevie Death. Kulshaw72RFC I just put that team on my left hand computer screen at work and the current team on my right hand moniter and just started uncontrollably weeping. The 1985/6 team however is a completely different matter. This oozed pure class and commitment all over the pitch. Stupid statement of the year award goes to you. windermereROYAL On this day in 2003 we lost a Reading legend Stevie Death. popped in to say this. “I got a few games last season and that’s something that I thought I would never be able to do, that was an amazing feeling,” Armstrong admitted. “I’m just thankful that I got those few games and managed to step out onto the Madejski Stadium pitch for the fans. “I loved every time I played for Reading from that first season I came here in 2008. “I just love playing and I had a decent debut season. “I have my player-of-the-season trophy at home and that means a lot to me. “I unfortunately never really managed to get back after that, but that’s life, isn’t it? You just have to get on with it."